The Fund turned blind eye to the failure to comply with several criteria. IMF Executive Board decided to continue the program of cooperation with Ukraine and the allocation of additional amounts of financial aid, the official website of President Petro Poroshenko reported on 15 September. The president praised the positive decision of the IMF Board of Governors regarding continuation of the program of cooperation with Ukraine and allocation of additional volumes of financial assistance. “IMF’s positive decision demonstrates that the world recognizes the implementation of reforms in Ukraine and the country is moving in the right direction,” Petro Poroshenko said and called that decision a “high evaluation of economic reforms and our first results and steps aimed at combating corruption, because anti-corruption strategy and practice is also an important criterion by which the IMF decides on crediting”. In his comment, the head of state emphasized that Ukraine received the third tranche of assistance within one program of cooperation for the first time in the history of Ukraine-IMF relations. The president noted that the IMF’s decision paved the way towards the allocation of the financial assistance from the United States in the amount of 1bn dollars, macro-financial aid from the EU in the amount of 600m dollars, as well as other assistance from other international financial organizations. It also opens the window of opportunities for the attraction of foreign investments in the Ukrainian economy. “This will allow maintenance of hryvnia’s stability, reinforce macroeconomic stabilization and support the first shoots of economic growth,” Petro Poroshenko said noting that the State Budget for 2017 would provide for the increase of social standards. The head of state called the IMF’s resolution a “signal for the aggressor” who tried to throw sand in the machine at the session of the IMF Board of Governors. “The attempts of Russia to undermine IMF’s solidarity with Ukraine and disrupt the decision on tranche have failed. Kremlin has lost this operation. 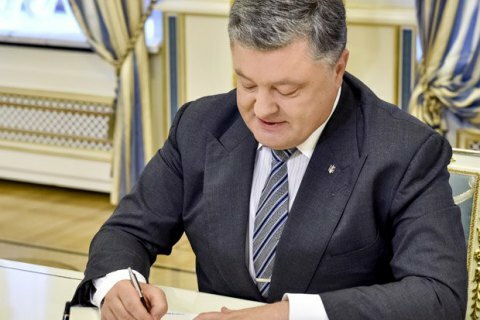 Reforms make us stronger and enhance our capability of countering foreign aggression,” Petro Poroshenko said and congratulated Ukrainians on the IMF’s positive decision regarding our country.